Central Jakarta Fire and Rescue Sub-dept. officers, evacuated a fallen tree with a diameter of 50 centimeters on Jalan KH Zainul Arifin, RT 09/04, Petojo Utara, Gambir around 4.05 PM.
" 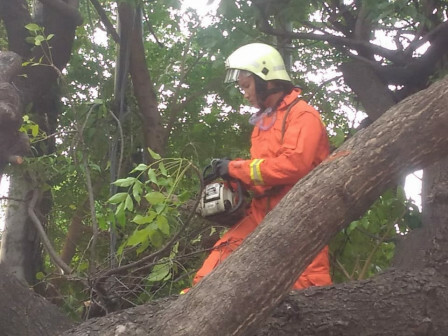 Allegedly it is due to old tree and fragile tree"
"Despite it doesn't disturb traffic flow, we remain evacuate the tree to avoid unwanted things," expressed Senggono, Head of Gambir Sector, Central Jakarta Fire and Rescue Sub-dept., Sunday (10/14). To evacuate tree, his side sent seven officers and one unit of light rescue to the scene. It was also assisted by PPSU officers. "Allegedly it is due to old tree and fragile tree," he said.